Scare your friends and family into the perfect mood with our Halloween decor, which includes personalized party napkins, guest towels and engraved picture frames. We have thrilling, brand new designs that can add to the festivities and tie everything together. All our napkins and guest towels offer up to three lines of text. Plus, new this year: you can ask us to print the top line larger than the bottom two lines, or you can have us print all three lines the same size. It’s your choice. We also offer napkins with plain edges or bordered edges, also called coin edges. Halloween Napkin. 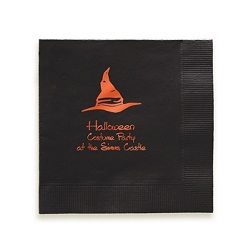 Foil-pressed or embossed, these napkins include up to three lines of text, your favorite spooky paper color and a choice of motif: candy, Frankenstein monster, witch’s hat, bats, jack o’ lantern, carved pumpkin, RIP headstone, black cat and boo ghost. Bordered edge. This also comes in a guest towel. Autumn Guest Towel. 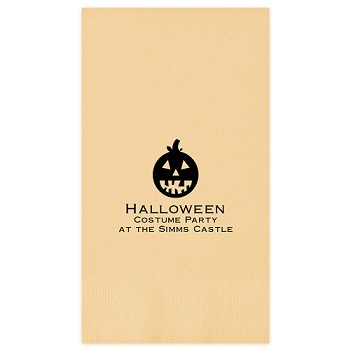 Foil-pressed or embossed, these guest towels work for all of Fall’s celebrations — like Halloween and Thanksgiving. They strike a warm and inviting note on your party table or buffet and accommodate three lines of text. Motifs include: fall leaves, harvest cornucopia, turkey and pumpkins. Bordered edge. This also comes in a napkin. Halloween Picture Frame. Pull out this beautifully engraved wood frame and display it as part of your Halloween decor. Remember this fun family holiday for years to come. It’s a wonderful gift for grandparents, too. Solid wood frame. Include up to two lines of text. Holds a 4″ x 6″ photo. Autumn Picture Frame. 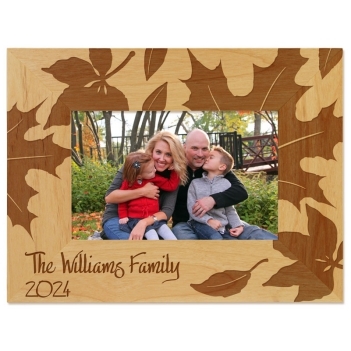 Celebrate the changing of the seasons with this festive, beautifully engraved, solid wood frame. Perfect for a mantel, end table or picture ledge. Include up to two lines of text in your choice of lettering style. Holds a 4″ x 6″ photo.